﻿ CSR Policy｜Pacific Industrial Co., Ltd.
Recognizing that sound business activities are expected and valued by society, and are the very foundation of CSR, we will contribute to sustainable development of society through all our business activities. As a true global enterprise we will do so in every nation and region in which we operate and in harmony with the economy, environment and society. We will engage in business activities, guided by sound personal business sense and wisdom as well as a sense of responsibility as a professional, while in compliance with national and international laws and regulations and the spirit thereof. We will work to enhance open and honest communication and establish win-win relationships with all stakeholders. We expect our business partners to understand the intent of this policy and to also act accordingly. - work to provide environmentally friendly, high-quality, and safe products and services that are trusted by, and satisfy, our customers. - protect and strictly manage personal and confidential information. - comply with the competition laws of every nation and region. - place importance on two-way communication and always improve our corporate value by taking a long-term view. - disclose appropriate information in a timely manner. - respect our business partners and establish a strong partnership with them on an equitable and fair basis. - comply with subcontractor laws. - conduct business trade in an ethical manner regardless of nationality and business size. - provide a workplace where all employees can work at ease in an environment that allows them to find work they can be proud of, and encourages them to demonstrate their creativity and spirit of challenge. - demonstrate respect for human rights and the dignity of employees and eliminate discrimination. - prohibit child or forced labor. - comply with labor related laws. - dialogue with employees in good faith. - promote human resource development. - takes environmental conservation and reduction of burdens on the environment into account throughout the entire process. - engages in environmental management activities. - prevents environmental pollution of the air, water, soil, etc. - saves resources and promotes waste reduction. - closely manages chemical usage. - complying with laws, regulations, and ethical norms of every nation or region. - establishing sound business relationships with government and regulatory agencies. - completely disassociating ourselves from antisocial forces. - protecting intellectual property rights. We will be actively engaged in various social contribution activities through close partnership and cooperation with communities to establish ourselves a good corporate citizen. 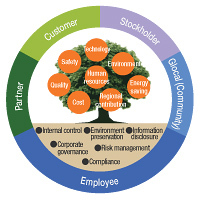 Amid many risks and dangers, we try to earn the trust and expectations of our stakeholders as a true global company. To this purpose, we have established the core elements of compliance, risk management, and corporate governance within all of our business activities. We established 'CSR conference' as a unification/promotion system of CSR activities with the president being as a chairman. Also based on a risk management, we organized every kind of committee and working teams and implement each activity.